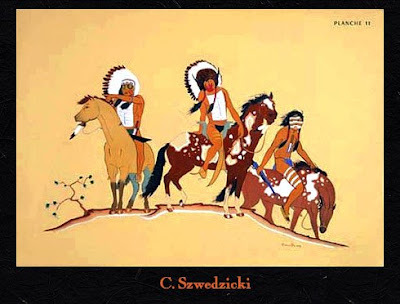 about 30 years ago i took a book out of the library about american indian paintings. (and please, let me say here, that though it makes absolutely no sense to me that after hundreds of years of realizing that north america was in fact not india, we still call them that -- except for in wee pockets like berkeley, where i live, in which on october 14th, when many of the rest of you in the states are 'celebrating' columbus day, we're observing indigenous peoples day -- the native americans in fact call themselves indians, which is easier than naming all the nations every time one wishes to refer to them... but still -- that's why i use that word). i loved the images in that book (which i haven't yet been able to find again. but i'll keep trying). what i loved about them, i came to learn as i learned more about japanese art and japonisme, were the same things i loved in those: simplicity with a direct freshness: art stripped to essentials, with absolute grace. and that line. now to be truth- ful, i'm not altogether sure any of these images are the ones i saw; funny what decades can do to memory. those, in the past, were more lustrous and fluid, like music on paper, and all that. yeah sure -- i'll report back when i find the book. but still, the relationships between the ancient japanese through to the present-day indian images are striking. How could this have happened?